The American Recovery and Reinvestment Act of 2009 provided millions of dollars to conduct periodic inspections of levees covered by the U.S. Army Corps of Engineers (USACE) Levee Safety Program. The firm’s task assignments included the periodic inspection (PI) of 42 separate levee projects encompassing approximately 130 total miles of levee systems and 66 flood risk management systems comprised of levee embankments, floodwalls, interior drainage and flood damage reduction channels in New York and Pennsylvania. The periodic inspections were conducted in accordance with the National Program to verify proper operation and maintenance, evaluate operational adequacy and structural stability, review design criteria to identify changes in current design standards, identify features to monitor over time, and to improve communication of the overall condition. The inspections were conducted using an ESRI based field editing application, linked GPS unit, and a Fujitsu field table. 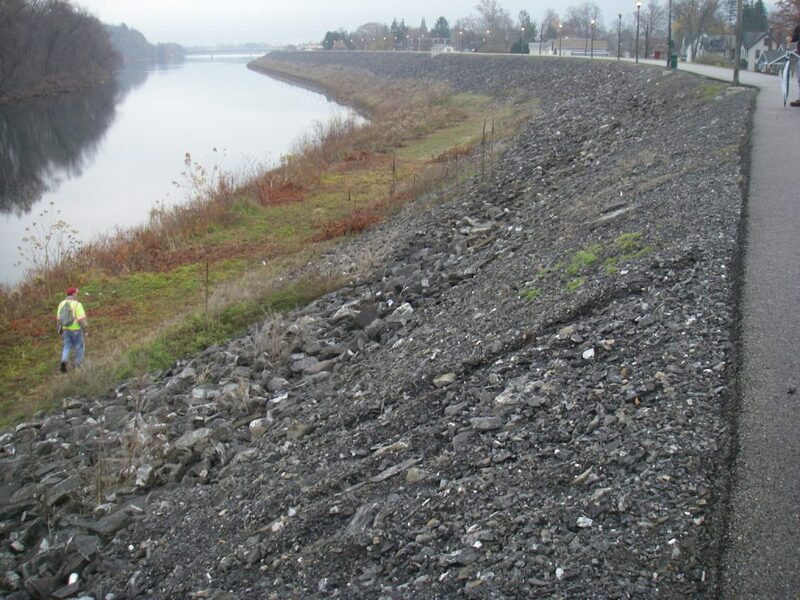 KCI was initially assigned the periodic inspection of 17.8 miles of levees and floodwalls along Codorus Creek in York, Pennsylvania, and Canacadea Creek and Canisteo River in Hornell, New York. Our field teams consisted of civil, geotechnical, structural, and hydraulic engineers. Prior to the inspection, engineers reviewed levee system documentation and evaluated the systems’ documented design criteria against current design criteria to ensure that each feature and the overall system functioned as authorized and to identify any potential updates needed. Engineers prepared a pre-inspection technical packet to document the systems, their histories, and operations and maintenance records. We worked hand-in-hand to help shape the program, considering everything from data and report formatting to close-out of past inspection observations. Using the USACE’s Levee Inspection System tool, engineers inspected all aspects of each system, including the levee crest, riverside and landside tows, and drainage and appurtenant structures. The field inspection also included verification of existing conditions, review of operation logs, identification of changes in the system’s floodplain since construction, and addressing impacts from modifications as a result of emergency response activities. Draft and final Periodic Inspection Reports detailed the results of the inspection including drawings and photographs. An Independent Technical Review by a qualified team not involved in the day-to-day production of the report provided a holistic review of the report and confirmed the proper application of clearly established criteria, regulations, laws, codes, principals and professional practices. Codorus Creek, Canacadea Creek and Canisteo River were two of the first PIs performed by the USACE Baltimore District and were treated as a pilot task to implement this new nationwide program. KCI used the lessons learned from these inspections to PIs for an additional 25 levee systems in Binghamton, Endicott-Johnson City-Vestal, Greene, Lisle, Nichols, Oxford, Whitney Point, Addison, Bath, Canisteo, Corning-Painted Branch, Elmira, Olyphant, Scranton-Albright Avenue, Scranton-Plot, Scranton-Southside, Wyoming Valley, Bull Run, Elkland, Lock Haven, Williamsport, Allentown-Lehigh River, Bethlehem, Chester and East Branch. These systems included 86.1 miles of levee protection, 11.5 miles of floodwall, 35 pump stations, 679 drainage structures and 83 closure structures.